The Alnor® Rotating Vane RVA501 is a handheld digital rotating vane anemometer that measures air velocity, air volume, and temperature in imperial or metric units. The four-inch (100mm) head automatically averages velocity and volume readings, making the RVA501 an essential tool for measuring unevenly distributed or fluctuating flows through heating and cooling coils, diffusers, grilles, and filters. Sweep mode quickly and reliably provides one averaged reading of velocity or volume over a large measurement area. 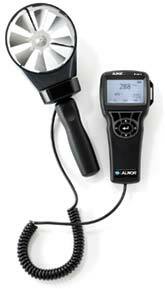 The detachable head is ideal for taking measurements in tight spaces. Its optional telescoping probe provides safe access to hard-to-reach locations and its data logging capability allows storage of more than 12,700 readings. Ideal applications include heating and cooling coil analysis, diffuser and grille measurements, indoor air quality tests and filter face velocity measurements.